Espresso Gastronomy, what is it for? Or rather what does it do? Study the attributes of the coffee, interactions within the coffee and finally, to use those attributes and interactions to catalyse the human taste and flavour perceptions, are being done by espresso gastronomy. Energy! According to the quantum physics there is matter and energy that everything has based on. In my opinion when energy imputed by mind the whole system of sensory experience creates. Here we are to experience the experience of the energy structure of coffee which is to elaborate within the range of coffee chemistry as I know which will help us to understand the espresso better and why espresso is a singularity of a drink where you have the balance between sweetness, bitterness & acidity while your sensory triangulation is being evaluated. There are so many chemical compounds are created while coffee is being roasted. These chemical compounds are directly responsible for the flavour profile of the coffee when it’s being evaluated. Such as, benzaldehyde (Molecular Weight: 106.12194) gives the aroma/flavour like almond, 2-hexanal (Molecular Weight: 98.143) gives the apple like aroma/flavour, 3-Mercapto-3-methylbutylformate (Molecular Weight: 148.22328) gives the blackcurrant like aroma/flavour or geosmin (Molecular Weight: 182.30248) gives earthy aroma/flavour and so on. By depending espresso brewing technique, intensity of those flavours can be varying. However, if we look at rancidity of the coffee, that can be produced from either by 2, 4-decadienal (Molecular Weight: 152.23344) or by activated chain reaction of fatty acids by a free radical that created by a photon. Therefore, I wonder; remarkably that Planck’s constant; wavelength of the light together can turn our coffee in to rancid. From chemical engineering prospective, roasting process consists of a combined heat and mass transport superposed by endothermic and exothermic reactions. Melanoidins that are being created via polymerization, through aldol condensation of intermediate unsaturated carbon with hydroxymethylfurfural can be responsible for the brown colour of the coffee while this phase, called; Maillard reaction generates number of nutty and other major flavour compounds. However, gastronomically by adding some of the chemical compounds or equivalent food/beverage states in to the coffee with the right phase equilibrium, we can create new flavours within, which will help us the see the unseen. If you are to create the flavour of honey in the cup, you may have to use a compound that has amino acids, glucose, fructose as predominant chemical compound as same as honey and also most importantly at roasting, Millard reaction to develop hydroxymethylfurfural inside coffee cells which is another main chemical compound in the composition of honey. Therefore by combining that compound with coffee; will help to boost or create unseen honey in the cup. When the day comes that an espresso is percolated to its optimum balance via sensory triangulation, the barista will become a master of espresso gastronomy. Therefore by understanding the right view of the espresso science, together with its art, you can make wonders beyond your senses. Rather than looking for the theoretical flavour notes. There is one mighty perception will profoundly shock you by understanding espresso or coffee gastronomy. Which is; the visibility of countless flavours is no longer argument against the invisibility of countless others. Tags: barista, chemistry, coffee, coffee chemistry, coffee science, espresso, extraction, flavour, gastronomy, SCAE, sensory triangulation, speciality coffee, taste. Bookmark the permalink. Thoughts on the recent trend of more objective measurements in the specialty coffee side of the the industry? Measuring TDS with refractometers, attempting to address water chemistry etc? Measuring TDS% (soluble concentration) of the coffee or elaborating the chemistry of the water have brought out a wonderful aspect of coffee science. Water chemistry is as much as important because pH levels,right temperature,TDS% can prevent your coffee achieving right flavour balance and optimum extraction due to unacceptable soluble particles. Is there a similar study on TEA, that would be interesting too. 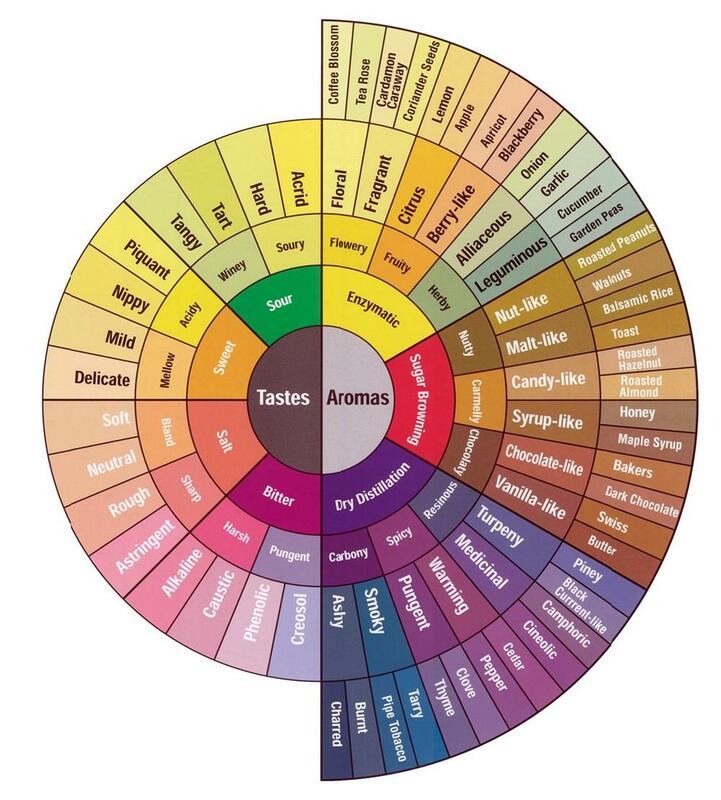 Sure, There is a flavour wheel for tea. By recognising tea and its processing method, you can study its behaviour, according to chemical composition. Cheers.